This reminds me of the central government’s own comical attempts to show public support for their scheme by publishing results of a biased survey to a skewed sample of mobile app users. The correlation between national policy and the results of local body elections in any state is non-existent at best. In a similar vein, Mr. Gurumurthy only mentions assembly election victories in states where the Congress party and/or its alliance partners faced anti incumbency. I cannot find fault with him for mentioning Goa and Manipur though. They are probably the only states where demonetisation had a positive impact on interested parties who were remonetised in a successful bid to form government. unreasonable inflation in the Indian consumer’s basket of staple assets. These assets are gold, real estate and stocks. determines inflation but rather the increase or decrease in the money supply, of which only a small portion is in the form of currency. Second, the valuation of each of the aforementioned assets is in no way connected to the presence of high value notes. Real estate price inflation is largely dependent upon demand and supply. Mr. Gurumurthy refers to the heady growth days of UPA 1 as fake growth that was largely jobless. He plucks out of the air a number of 2.7 million jobs created in the UPA 1 and 60 million created in NDA 1. The 60 million figure for NDA-1 is obtained from a published NSSO study. However, as Rajya Sabha member Prof. Rajeev Gowda has earlier pointed out, this number reflects the number of people who marked themselves as employed in a survey and includes a large number of people self employed in agriculture. When one looks at jobs in the traditional sense which is organized sector jobs, the story is vastly different. To reiterate some of the points he made, the same NSSO survey report also shows a decline of 1.7 million people in organised public and private sectors during NDA-1. The NSSO survey data also show how during 2004-10, there was a net increase of 2.3 million people in organised sector jobs, implying UPA-1 created more “jobs” than NDA-1. Lastly,according to data published by CMIE, the average growth rate of organized sector jobs was -1% during NDA-1 and +1.5% during UPA-1. Huge gains in black money detection, disproprotionate increases in direct tax assessees and collection, reduction in hawala based on “intelligence” wire taps and winding up shell companies are some of the alleged benefits of demonetisation, as stated by the current government and retierated by Mr. Gurumurthy. However, the numbers quoted by Mr. Gurumurthy simply don’t add up. For starters, there is no available information to ratify Mr. Gurumurthy’s fanciful claims that 2.9 Lakh crore of cash deposits are under tax probe and 45,000 crore has been uncovered. Secondly, as per the Ministry of Finance’s own press release on 11th of October this year, there is only a 15.8% year on year increase in the annual net collections of direct tax and a 11.5% increase in Advance tax receipts, a tad lower than the 12.12% growth for the same period last year. On the issue of currency in circulation, the total currency in circulation has reached nearly the same levels as pre-demonetisation as of 10/28/2017. The only reason it’s not crossed the figure is due to a shortage of currency from RBI. Mr. Gurumurthy also offer proof of increase in digital payments as evidence of the longer term positive impact of demonetization. It is important to note that the obvious bump in adoption of digital payments due to demonetisation has long since plateaued. The plateau is at a higher normal but at what cost? A quick study in behavioural economics might have helped the government realise that using incentives would have resulted in better adoption at lower costs. The formalisation of the economy is the red herring of Mr. Gurmurthy’s argument. Demonetisation pushed the informal economy into infomal bankruptcy. A lack of credit availability and the increased cost of doing business are just two of the reasons that India’s informal economy stays where it does. It isn't a group of tax avoidance experts but rather survivors who continue to remain our nation’s employment engine. A celebration of an increase in term and time deposits is meaningless unless it is accomplanied by credit expansion to these small and medium sector warriors. When banks transfer funds to the RBI as excess liquidity due to demonetisation, it is the clearest indiciation that they are not going to push for an increase in credit availability. It is thus a fallacious argument that demonetisation is responsible for systemic change in the economy. 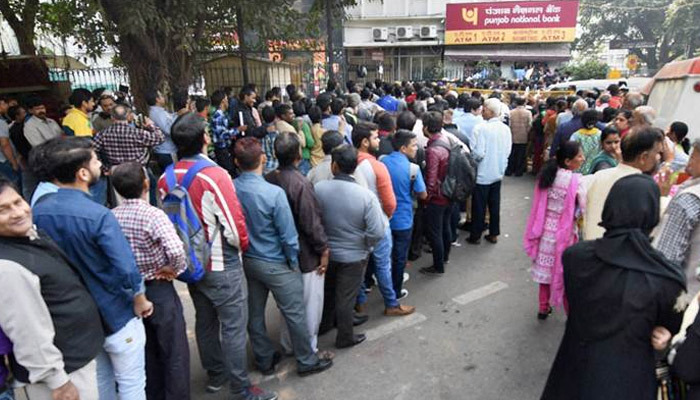 If the goal was to have a higher percentage of the economy in the formal sector, the only way demonetisation might have temporarily accomplished this was by destroying as much of the informal economy as it could. With this destruction of value has come an increase in unemployment and a 2 % point drop in GDP drop amounting to 3 + Lakh Crores in the formal economy. In sum, all that demonetisation has achieved is destruction of the livelihood of the informal, agricultural and SME sectors, increasing the liabilities of banks while eroding the value of assets held by them. A largely ill thought out act that should be remembered for no other reason than to ensure it is never repeated.